Just a few short months ago the fate of Warner Bros.’ DC movie universe was in total question, as we didn’t know which films they were moving forward with or if any of the “announced” titles were even going to see the light of day. One of those films was the promising Birds of Prey, which will focus on Margot Robbie’s Harley Quinn and an interesting cast of female characters around her. No matter who’s involved, we’ve always wondered if it would actually happen. While that still may be the case, the project took another step in the right direction by officially announcing a villain for the story. Although the reveal isn’t straight from the mouth of WB or anyone involved in the project, The Wrap has reported that longtime Batman villain Roman Sionis, otherwise known as underworld crime lord Black Mask will be the big bad Quinn and company will be going up against in Cathy Yan’s film. The project has taken some strong strides over the last few months, as the characters who will be part of Quinn’s team were revealed to be longtime favorite Black Canary, Huntress, Renee Montoya and a younger version of Cassandra Cain. As I mentioned earlier, Black Mask is a very well known and quite popular villain to the Dark Knight. Roman Sionis was born to one of the richest families in Gotham. Unfortunately, he went down an eventual dark path that led him to letting his family business, Janus Cosmetics, fall into a distant memory. Oh, this all followed the event that shaped him, murdering his parents in a fire. That dark path continued as he became a major crime lord in Gotham and adopted the alias of Black Mask. In some versions of the character, it is in fact just a mask that’s made directly from the casket of his father. In others, it’s melted to his face. I would personally like to see a combination of both of them. 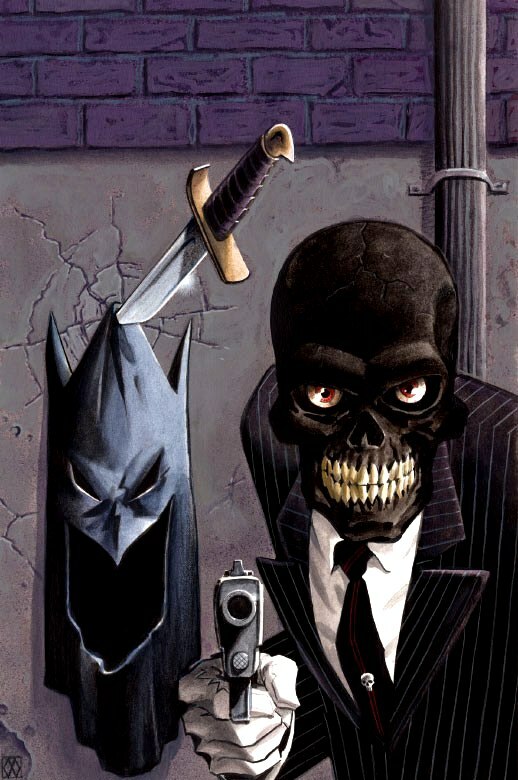 I would love to see Batman and Black Mask go toe-to-toe with each other on film, especially since you can give them a backstory together as being friends and growing up in the wealthy part of the city. While that could happen eventually, he’s a fantastic choice for foe in Birds of Prey. These characters, these women, aren’t all powerful like some other DC characters. It sounds like they’re truly going for a gritty, underground-crime type film and if that is the case, that’s absolutely fantastic. WB and DC seem to be learning from their mistakes and rather than give us something gigantic like Suicide Squad, they’re going for exactly what Suicide Squad should’ve been in the first place. Count me in. What do you think of this news? Is Black Mask a great choice for villain opposite Harley Quinn, Black Canary and others? Who do you think could play the character? Fire off in the comments below! Birds of Prey is eyeing a 2020 release date and will reportedly start production in January of next year, with Cathy Yan directing and Margot Robbie producing. Tagged as: Black Mask, Cathy Yan, DC, Featured, harley quinn, Margot Robbie, Suicide Squad, Warner Bros.